LINK is always installed so that your original seat is used. This means no lost space or seat that doesn’t match the rest of the vehicle. You’ll be able to enjoy the original features of your vehicle while taking advantage of LINK’s unique customization. With LINK, you’ll be able to enter and exit your vehicle at the ideal height for you so that you’ll get a level transfer. The LINK also offers a lift up feature which alters the movement of LINK and will gently lift the seat to assist you in standing. Every LINK movement is controlled at your fingertips. 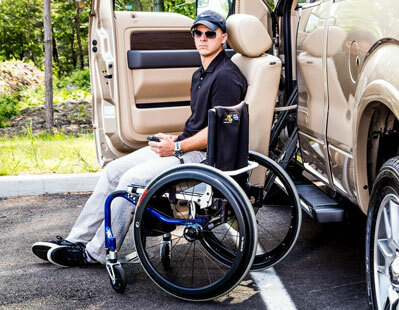 Tilt, rotate, recline, lift and even rock once you’re inside the vehicle for even more comfort while you’re seated. The reason why so many people love LINK is because it lets them enjoy the vehicle they originally purchased without having to make any structural modifications. You don’t need to sacrifice on headroom, legroom or any safety features like airbags, seat position sensors, weight sensors or heated seats with LINK. Ready to learn more about LINK and if it’s right for you and your vehicle? The experts at London, Ontario’s Goldline have over 40 years in the mobility and conversion business and can help you pick what’s best for your unique situation. Please contact us today to learn more about LINK!